Your 8-10 Month old baby might be crawling and trying to pull herself up. and she may not have a big interest in eating. As noted in the Is my Baby a Picky Eater page, your baby may suddenly begin to refuse to eat because she has more important things to do – like pull on the cat’s tail or munch the scrap of paper she just found. At this stage, your little one may also start to Refuse to be Spoon Fed. and softly mashed, or chopped into fine pieces, fruits, vegetables, meats, pasta and dairy such as yogurt and cheeses. Meats and proteins such as egg yolk, should be cooked and pureed or chopped into small soft bits. If offering Tofu, you need not cook it first. Remember, your baby will not have molars until sometime around the 12-18 month age range so all foods should be easily mashed between the gums. How much will your 8 month – 10 month old baby eat? Your 8 to 10 month old baby may seem to be starving herself at some point. Because you are likely offering her more finger food selections or thicker/chunkier foods, the amount of food eaten appears smaller. At this stage, your baby may be eating 3 “meals” a day and possibly enjoying a snack or 2 in between. There are some babies in this age range who will still be eating only 1 “meal” of solids so don’t feel pressured to have your baby eat 3 solid food meals per day. The important thing is to watch your baby’s hunger cues and and try to begin setting a schedule for 3 meals a day. Offer him a balanced array of foods – fruits, veggies, a protein & a grain if possible and ensure his nursing or formula feedings are adequate. Visit the Baby Menu to see an idea of some meals for this age range. 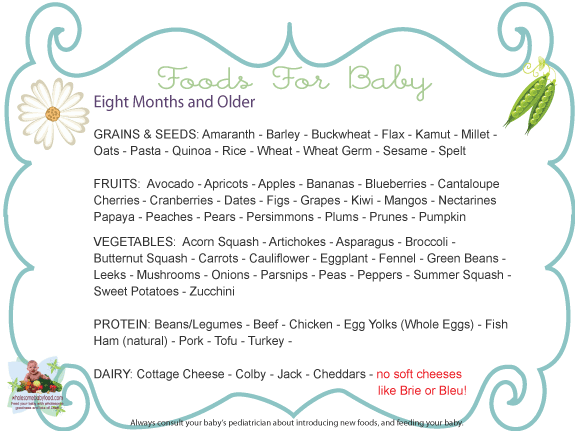 Stages of Solid Foods – 8 months and older – Baby Let’s Eat! 8 Months – Give me it all! Bring on some spices (8 months old) and the softly mashed, or chopped into fine pieces of fruits, vegetables, meats, pasta and dairy such as yogurt and cheeses. 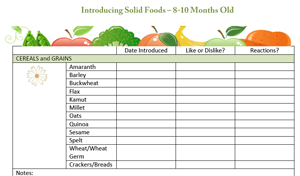 Download the new 8 month old food diary chart!